We began the Swinford ESB wall flowerbed at the end of September 2015. Little did we know then that it would start raining soon after, non stop, for months & months! 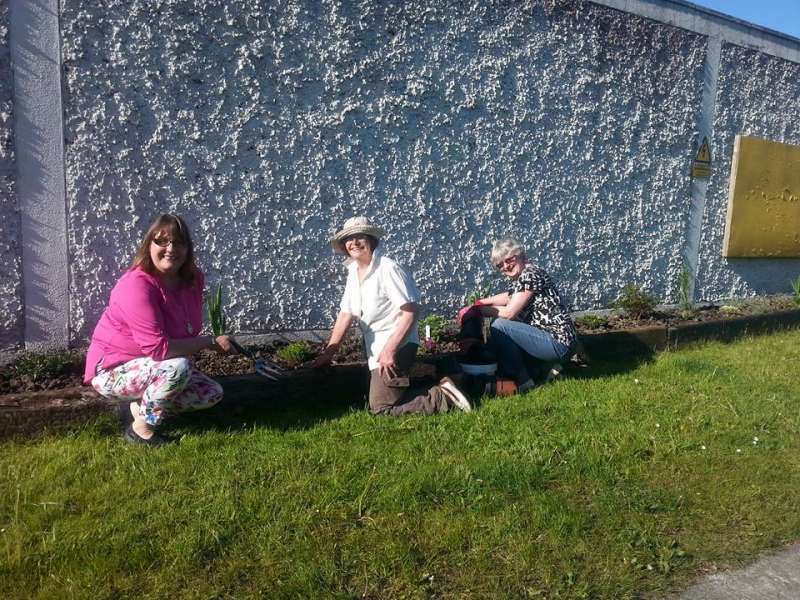 Swinford Tidy Towns began the Swinford ESB wall flowerbed project towards the end of September last year. The soil along the wall, as well as been poor, it was also quite shallow. We decided to build a raised flowerbed and decided on timber, being the simplest and quickest to construct. The wall is just under 150 feet in length. It looks a lot longer when looking along it from one end! We decided on using old reclaimed railway sleepers. As well as being maintenance free for the future, they were also easier to use for the construction of the flowerbed. In all it took 16 railway sleepers, each 9 feet long. Unfortunately due to the incessant rain that fell last Autumn, we got held up filling the flowerbed with soil. It was just constantly too wet to dig any soil. Thankfully after months of constant rain, we eventually got the project back on track in the Spring of this year. The flowerbed is about 2 feet wide and about 14 inch’s deep. In all it took nearly 10 ton of top soil to fill. Hard to believe but true! Thanks to Swinford area office staff of Mayo county council who helped us out. They supplied and filled the flowerbed for us which saved us a lot of back breaking shovelling! Planting of the flowerbed began in March when thankfully, the weather began to pick up. We would like to say a huge thanks to Swinford Indoor Country Market committee ladies who offered to plant the flowerbed for us. It was a huge undertaking but we’re sure you’ll agree, they have done a wonderful job! There is quite a variety of shrubs and flowers planted in the flowerbed. Some of the shrubs include Hebe’s – “Caledonia”, “Baby Marie”, “Magic Summer” and “Heartbreaker” to name a few varieties. There are also Daffodil bulbs planted for some early spring colour and more to be planted later in the year. Some of the flower varieties include “Lupins”, “Anemone De-Caen”, “Aguilegia”, “Ranunculus” and “Ixia Gememgd”. In very dry weather when the flowerbed needs watering, it takes approximately 400 litres or water wold you believe! Thankfully we have a rainwater harvesting system set up to cater for all our watering needs!